An frequently used saying of his. Quoted in Wilfrid Meynell, Benjamin Disraeli: An Unconventional Biography (1903). Also attributed to Samuel Johnson. Attributed by Mark Twain in "Chapters from My Autobiography," April 1904, North American Review (7 Sep 1906), later in : "Figures often beguile me, particularly when I have the arranging of them myself; in which case the remark attributed to Disraeli would often apply with justice and force: 'There are three kinds of lies: lies, damned lies, and statistics.'" 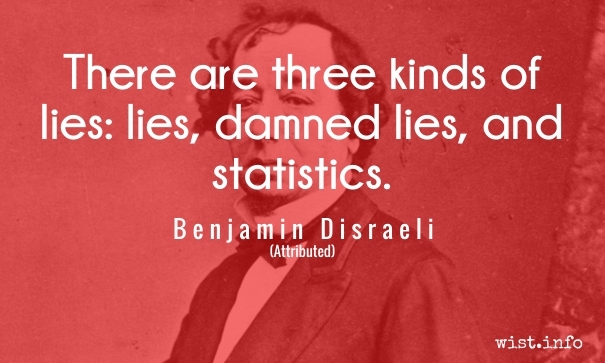 The phrase has not been found in any of Disraeli's works, and he is considered unlikely to be the originator (see here and here for more discussion). Regarding attacks on him in Parliament. Quoted in John Morley, Life of William Ewart Gladstone (1903). Tact teaches you when to be silent. Frank and explicit: That is the right line to take when you wish to conceal your mind and confuse the minds of others.